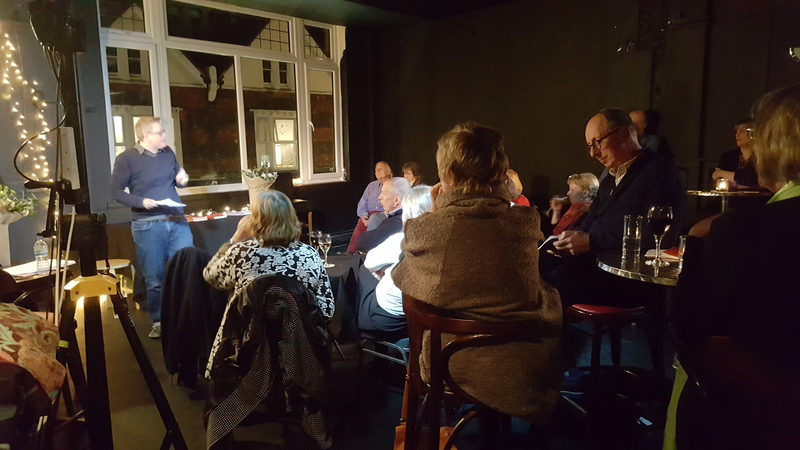 It was a lovely evening at the Poetry Cafe last night – and a very high standard of readings I felt – there was music too: I don’t normally go for bits of singing inserted into poetry, but Tom Cunliffe gave a riveting performance including just that. It set the atmosphere alight. It was nice to encounter again Katherine Gallagher who I met earlier in the month when we were both reading at the Lamb Festival. Katherine brought her own brand of anecdote and self-deprecating charm to the business of introducing the Palmers Green poets, while I struggled to haul myself out of a sofa in an elegant fashion each time I got up to introduce ours. Paul McGrane did a great job of organising the whole thing and adjusting the mic stand seemingly for every reader, we were all such different heights. In the Palmers Green camp I particularly enjoyed Joan Michelson‘s reading – I’d come across Joan’s name a lot but we hadn’t actually met before – and Judith Willetts. Our Brighton Stanza poets were wonderful, of course – but then I would say that! Big thanks to Tom Cunliffe, Antony Mair, Peter Kenny, Ponnie Dudley and Marion Tracy for coming along and to our supporters on the night. And to Peter especially for paying for the cab that got us to Victoria in time for me to catch the 21.47 home, in time to join Nick in the pub after his students had performed their last concert of the year, a glass of wine and the balmy stroll home at midnight. Happy days. Yes, a good evening and thanks for including me at the last minute. Sorry I left early – I thought it would take longer to get to Charing X than it did, and landed up waiting there for the fifteen minutes I could have spent with all of you! Ah yes, shame you and Marion missed the photo! And thank you for stepping in / stepping up / whatever the expression is – at the 11th hour – oh dear I’ve come over all cliche. Definitely not a day for writing poetry! sorry to miss it Robin, hopefully another time! !